Over the past few weeks, Democrats and Republicans in both the State Senate and Assembly have been selecting their caucus leaders for the 2017-18 legislative session. The Senate Republicans held their elections first, two days following the election. The now 20-member caucus voted to maintain their current Senate Majority Leader Scott Fitzgerald (R-Juneau), making him the longest serving Senate Majority Leader in state history. The caucus also elected Senator Roger Roth (R-Appleton) to serve as Senate President. 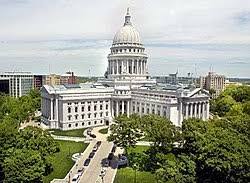 The Assembly Republicans followed suit, re-electing their current Speaker of the House Robin Vos (R-Rochester) and current Majority Leader, Representative Jim Steineke (R-Kaukauna) to lead the largest Republican majority since 1957. In his election speech, Vos highlighted the caucus’ commitment to finding a long-term, sustainable solution to transportation funding. Assembly Democrats also re-elected their current Minority Leader, Representative Peter Barca (D-Kenosha). In a speech following his election, Barca acknowledged the “gut-wrenching and just shocking election” noting he thought Trumps nomination would lean the country democratic. Barca continued by saying Democrats need to do a “total Reassessment” and focus on reconnecting with the working class. Representative Dianne Hesselbein (D-Middleton) was elected to serve as the assistant minority leader. Finally, the Senate Democrats re-elected Senator Jennifer Shilling (D-Lacrosse) as their minority leader. “I am excited to work with all of my colleagues in the Senate and continue serving as a strong voice for the values and ideals of Wisconsin’s hardworking families. Now more than ever, we need to hold Republican leaders accountable and fight for quality schools, safe roads and strong communities,” Shilling said in a statement. Senate Democrats also elected Senator Janet Bewley (D-Ashland) to serve as Assistant Minority Leader. Minority Leader – Sen. Jennifer Shilling. Assistant Minority Leader – Sen. Janet Bewley. Democratic Caucus Chair – Sen. Mark Miller. Democratic Caucus Vice-Chair – Sen. Janis Ringhand.